Technology has always been at the heart of Formula 1, but traditionally the efforts of engineers have been geared towards building an ever-faster car. In recent years, however, the speed of a different track - the type that carries a broadband internet connection - has proven as vital to winning the prestigious championship as the pace of wheels on tarmac. Real-time data analysis on every aspect of a vehicle's performance, from tyre pressures to aerodynamics such as down-force and drag, are fed right into the headsets of drivers like Sebastian Vettel and Lewis Hamilton, and mere milliseconds make all the difference. As António Félix da Costa - Infiniti Red Bull's 22-year-old test and reserve driver - says, without the data from the team's boffins, "you'd go for two laps and then stop and break down". The problem facing Formula 1 teams, however, is that the sport's governing body - the FIA - restricts them to 60 staff members at the trackside, including engineers. It takes many more heads to accurately interpret the data being fed from the 150 or so sensors embedded on the cars, leaving the teams with just one option: super-fast internet connections that can transmit gigabytes of data to headquarters in an instant. "The only way to really support the team is to get information back to the factory," explains Red Bull's head of technical partnerships, Alan Peasland, "and to have extra people there help work on that." "At the factory, they are able to run simulations in real time." 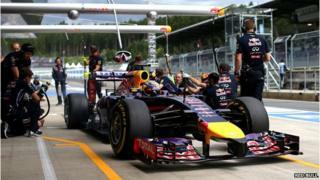 However, super-fast reliable connections are no easy feat when it comes to the travelling circus that is Formula 1. When in season, the sport moves to a new track every fortnight, and the 20 circuits are dotted around the globe: China, the US, Australia and Monaco are among the locations. Nonetheless, as Mr Peasland explains, teams demand a temporary network that "acts as if it's a permanent one". To do this, AT&T, which supplies the communication systems to Red Bull, deploys an army of engineers to each location, installing a connection that has a maximum delay period of 300 milliseconds - the time it takes for a human eye to blink. When the races are held closer to Red Bull's factory, which is based in Milton Keynes in the UK, the delay can drop to a staggering seven milliseconds. And a colossal amount of data is being transmitted over the network - sometimes amounting to over 100 gigabytes each second. Included in this is high-definition video of every aspect of the car, as well as information from thousands of sensor points that can then be used to simulate a driver's experience back at the factory. Precise weather readings and the locations of other cars are also transmitted back to HQ, and the accumulated data informs every decision made on the track. To make things more complicated, the vehicles are nearly always brand new. "At almost every race this year, we'll be bringing new components that have never been run on a racetrack before," explains Mr Peasland. "It's a completely bespoke car for each circuit." As a result, split-second decisions need to be made during the race on whether to modify the driver's line, whether to pit or wait it out, and even whether to replace or modify a part. Sometimes, small components will even be 3D-printed on the spot based on an analysis supplied by the factory. "We change our strategy live as it happens," says Mr Peasland. "But nothing should be guesswork - all intelligent decisions based on information." As this information becomes increasingly vital to F1 teams, the reliability of the network is ever more important. The firm that supplies connections to the Mercedes team, Tata Communications, says it uses over 62,000 miles of cabling in just one Formula 1 season. Its fibre optic network is 240,000 kilometres long - enough to circulate the entire world six times - but connecting the cable to the track still requires a monumental effort. "We've created two teams, an 'A' team and a 'B' team, which leapfrog each other to different places," explains Mehul Kapadia, managing director of F1 business at Tata Communications. This ensures that irrespective of where the race is happening, Tata has a blindingly fast network up and running within two days - the sort of lead time that businesses and home broadband users can only dream of. Just three hours after the chequered flag comes down, everything is wrapped up and shipped off to the next location. But speed is not the only factor to be considered. The data travelling from the track to the factory and back is highly confidential, and any leak to an opposing team could cost a driver the race. Both AT&T and Tata insist their networks are secure, but they are tight-lipped about precisely how this is done - the sort of secrecy that usually surround the teams' mechanical engineering plans. Yet as the data driven elements of F1 get more and more sophisticated, the networks supporting the top teams are of increasing value - to be guarded as ferociously as any engine part. As Mr Peasland says: "This is a development race as much as it's a car race." Shhh! It's time for Formula E!